Gaming Club Casino Review 2019 | Here's All You Need To Know. Gaming Club makes the impressive claim to be the oldest online casino in existence today, dating its history all the way back to 1994. While this is certainly a guarantee of legitimacy, it could also lead new players to fear that the casino has become outdated or out of step with current trends in the gaming industry. In fact, this is far from the case, as this Microgaming powered site has kept up to date with the ever-changing gaming market, and continues to provide its players with a superb online gaming experience. WHAT IS Gaming Club Casino? While it is impossible to verify whether Gaming Club is, in fact, the oldest active online casino in the world, it is certainly one of the veterans of the industry since it dates back to the mid-nineties. The good news is that this elder statesman of the gaming world has not gone stale with time, but has continued to evolve and grow to satisfy its army of players. Visually this site has gone for a classic and classy look with an emphasis on traditional casino play, although there is a very large selection of slots and instant win games available here too. 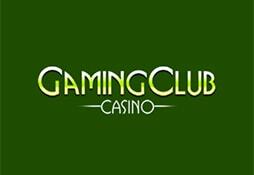 Gaming Club offers a tempting welcome bonus for new players, which can amount to a maximum of $/€350 to use on the site. The welcome package offer is split over the first two deposits made by a new player, with a 100% bonus to a max of $/€200 based on the first deposit followed by a 150% matching offer on the second deposit to a maximum of $/€150. lly only applies to slot gaming fans as wagering on table games counts for little or nothing in terms of meeting the play-through requirement. Besides the welcome bonus there are daily, weekly and monthly promos and offers to keep existing players happy, as well as a loyalty programme that offers loyalty points every time you play a cash game on the site. As you would expect from an online casino with so many years of experience, Gaming Club has earned a reputation as a trusted and secure gaming site. The casino is licenced and regulated by the Malta Gaming Authority which is a guarantee of player safety and fair play. Funds can be securely transferred to and from the site using a variety of different methods, with credit and debit cards the most popular option available. Neteller is an electronic payment method which promises fast and fully secure fund transfers in the shortest amount of time, and other methods are available subject to local availability. Gaming Club promise to complete withdrawals within 48 hours wherever possible and VIP clients are given even faster withdrawal privileges. Gaming Club is powered by the team at Microgaming, which means that you can expect to find a wide range of traditional and new online real money games to choose from. Some of the top Microgaming slots available at Gaming Club include Mega Moolah, The Dark Knight, Treasure Nile, Tomb Raider and Game of Thrones. These are complemented by the full range of Microgaming table games and video poker titles, as well as a live dealer option for those who want to enjoy an enhanced gaming experience. An excellent feature offered at Gaming Club is the opportunity to play in regular slot game and blackjack tournaments, where players can pit their skills against their rivals in live battles with major cash prizes on offer. Gaming Club have long had a commitment to putting their players first, which is one reason why they have managed to endure for such a long time in this competitive business. Customer Support is available 24 hours a day to provide professional and courteous assistance with any queries related to the site. Apart from the always available live chat option, there are a number of toll free phone lines so that customers from all over the globe can speak directly to an operator without having to pay excessive phone bills for the pleasure. Gaming Club have a well-earned reputation for professionalism allied to a friendly approach which is why their customer service is so highly regarded. This Microgaming powered club offers the best of that esteemed providers gaming output, covering video slots, progressive jackpots, video poker, scratch cards and live casino games. There is a whole lot to like about this sophisticated gaming site, which is why it has been attracting online players for more than two decades now. Available in desktop and mobile format, Gaming Club has got devoted fans from all over the globe who enjoy the attention to detail which has brought this site so much lasting success. Live gaming tournaments add spice to regular slot and blackjack game play, and are one of the factors which seems destined to ensure the continued triumph of this entertaining online casino.